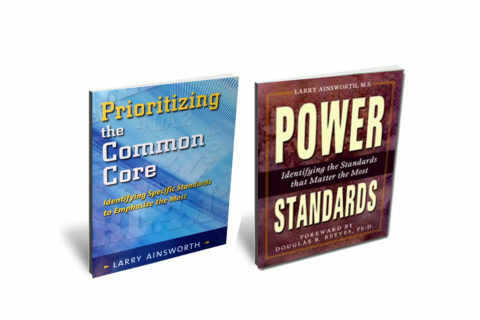 In 2013, I wrote Prioritizing the Common Core: Identifying Specific Standards to Emphasize the Most. Applicable to all standards in all grade levels in every state, not just the Common Core, this updates and expands the original process by clearly distinguishing Priority Standards as the most rigorous or comprehensive ones, and the others—the Supporting Standards—as the instructional scaffolds to the priorities. A comprehensive update to the original book! Although written to address the Common Core standards in both ELA and math, the rationale, process, and examples are directly relevant and applicable to all state standards in the U.S. and all provincial learning outcomes in Canada. In-depth rationale for prioritizing the Common Core State Standards. Charts showing the large numbers of CCSS at every grade level, K-12, in both ELA and math. Step-by-step process explaining how to prioritize the K–12 standards, in both content areas. Reader’s Assignments to immediately apply the information and select your Priority Standards. Practical strategies for soliciting feedback from all participants, especially those not involved in the initial selection process. Narratives by district leaders from six different school districts in six different states describing how they identified their Priority Standards. The original volume! A special feature is a detailed summary of the process three different districts in three different states used to identify their Power Standards, with accompanying commentary by those who directed the work. Each district’s process is described along with selected examples of their identified Power Standards. Step 1: Make initial selections using selection criteria. Reach initial consensus. Step 2: Look for connections to state tests. Make changes as needed. Step 3: Chart selections for each grade. Step 4: Vertically align Priority Standards K-12. Resolve uncertainties. Reach group consensus. Step 5: Acquire feedback from all sites. Step 6: Revise, publish, and distribute. For more information about bringing the Priority Standards Workshop to your school or district, please contact Larry Ainsworth directly. His email address is larry@larryainsworth.com.